A database tool available for Windows XP or later, 32/64 bit compatible. The database contains all technical information about each recording and SID File that was in the recording queue. Powered by "Stone Oakvalley's Text Database Searcher (SOTDS)" tool. Download links below. SOTDS is portable software so simply execute the "SOTDS_Searcher.exe" and choose your database. 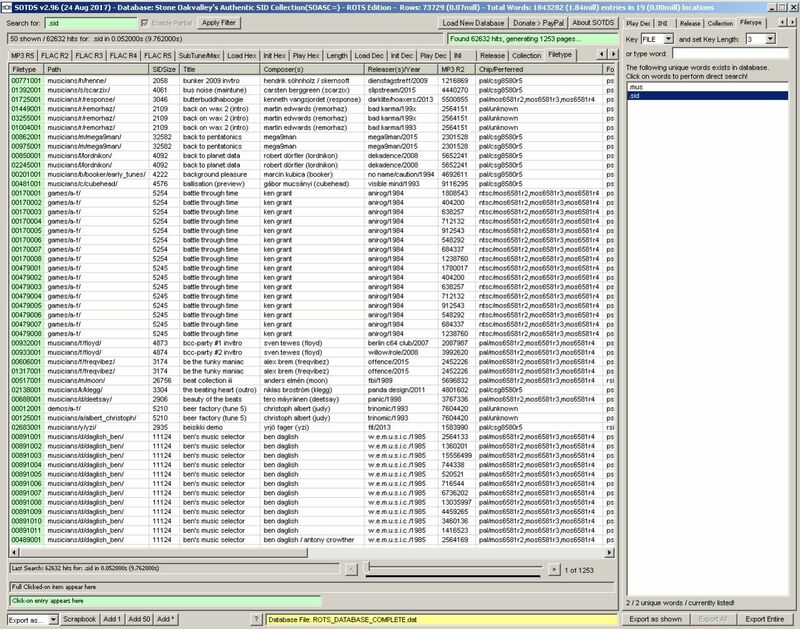 2 databases was created, one for the original SOASC= which concluded the entire HVSC #49 collection for 3 SID Chips (R3,R4, R5) producing MP3 files, performed between 2006-2009. The second database are the newly finalized SOASC= ROTS which concluded every single release of HVSC #50 up to #67, including the entire CGSC #133 collection. This project recorded 4 chips (R2,R3,R4,R5) producing FLAC and MP3 files, performed from January 2015 until August 2017. You can sort/filter/show/search/export for the following terms listed below.